Memorable Moment - I've seen this film a few times, but I still enjoy watching it because of Tom Hanks. He really is a fantastic actor. Only he could spend the majority of a movie alone on an island, barely saying a word, and give such a captivating performance. 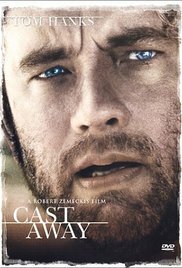 There are a lot of heartbreaking moments in this film, but for my memorable moment I had to choose something funny; that's the beauty of Cast Away - it makes me laugh as well as cry. On Chuck's first night on the island he is awoken by a loud thump. And then another. The noise scares him, but in the darkness he is unable to make out what is causing the sound. The next day he hears it again and yells out "What is that?!" I laugh every time I see this scene. The way Tom delivers that one line is perfect - the confusion and fear mixed in with a comical question thrown out for nobody to answer. He is a castaway in a life and death situation, wondering how he will ever survive on this island, and he has to deal with a crazy noise that he can't identify. The scene stands out to me because it shows that even when everything Chuck has is stripped away and his life as he knows it has been taken from him, after he's survived a deadly plane crash and a violent night at sea, he can still be afraid of a seemingly small thing in comparison - an unknown sound. But mainly it's Chuck's confusion that makes this so funny because it's such a normal reaction - to wonder what the hell is making that noise and to ask someone what it is.